A country-rock album with superbly written melodies and very catchy tunes, appeals to all age groups. The Rusty Lugs, as the name implies, are not a group of young musicians just starting out. Individually they have played countless weddings, club dates and festivals in various bands on Long Island and New York City. The band was formed to perform John Graybosch's original songs. John Graybosch is a unique and gifted song writer. He composes, plays guitar and sings. His melodies are outstanding, original and captivating. You'll find yourself singing along in no time. Listen to the raw edgy sound of "The Shanty," it has a country swing beat with some of the hottest guitar licks you'll hear anywhere. And true to his Southern upbringing, he can really tell a country story. Listen to "The Rock Island Line," be sure to listen all the way through or you'll miss the bands incredible rich vocal harmonies. Ralph Smorra plays drums and sings. Ralph has a velvety voice that really stands out on ballads. He began singing while in the US Army stationed in Germany. He won a singing contest while in the service and he was on his way. He has been performing since the mid 1970's. Listen to his incredible voice on "Try Try Try," "Let My White Dove Fly" and "Can't You See." Andy Martinez can play many instruments but he is a guitar player's guitar player. His father gave him a guitar when he was 6 years old and he was so drawn to it his parents had to coax him to take a break and watch T.V.! He has performed with Chubby Checker and has opened for acts such as Johnny Maestro. He plays lead guitar on most of the Rusty Lugs Tracks. He also plays Dobro, Banjo and Acoustic guitar on the album. Listen to his incredible vocal rendition of "If I Could" backed by Lisa Ann on track 3. Robert E. Shaw (Bob) is the bass player and bass vocalist in the band. He also plays the character part on "Junk That Thing." Bob played the upright bass in college for the college jazz band for 4 years. He now is a music teacher on Long Island. Bob is not featured on this album as a lead vocalist although he is quite capable. Listen to his rich bass vocal harmonies on "Try Try Try," "Let My White Dove Fly," "Can't You See" and "The Rock Island Line." Lisa Ann Chicorelli has been singing ever since she discovered her vocal cords as a wee tot. To date no ones been able to quiet her! After graduating college with a degree in music performance, she has been teaching piano, voice and doing solo gigs throughout Long Island. Listen to her on "Forever You and Me" a duet with John and on "Can't You See" a duet with Ralph also on "If I Could" singing harmony with Andy. In her own words "The only joy that beats singing, is singing in a band with the rest of the Rusty Lugs! 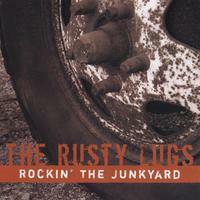 Although Seth Shaw is not a regular member of the Rusty Lugs, he did play drums on five songs on "Rockin' The Junkyard" including "Pack Up Your Bags" and "Highway King". Seth Shaw is currently a Junior at Farmingdale State University here on Long Island. I honestly can say I found no interest in country music, but when i stumbled upon www.rustylugs.com and heard a sample of their music, I couldnt stop listenin to each and every sample. The musical talent displayed by these artists is phenominal, I mean I even started humming the tunes later on that day. Soon after i baught the cd and im not dissapointed whatsoever. I now have a totally different outlook to country music. If i havnt already made it clear, i completly recommend this album to all of you. You will be 'rockin the junkyard' along with them when you hear the great vocals and awesome guitar. I know I am. Honestly, I don't think this group could get any better--well maybe, but not much. The playing & singing by the Rusty Lugs is beyond excellent. No matter if it's male vocals or the female vocal, they are just fantastic to say the least. These songs are so good it's frightening. And the performance and production is unreal. It's like you can actually hear every guitar note, every nuance, every strummed chord--just beautiful. I also can't wait for the next Rusty Lugs CD. I have a feeling this one will be worn out by then.